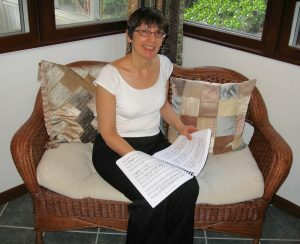 Composer Janet Peachey has written music in a wide variety of genres: opera, ballet, orchestral, chamber, piano, and vocal. Her works have been performed to critical acclaim in North America and Europe. Dr. Peachey has received grants for composition from the National Endowment for the Arts, DC Commission on the Arts and Humanities, Meet the Composer, Alban Berg Foundation, and the City of Vienna Cultural Council, and has had music published by Arsis Press. She was a two-year Fulbright grantee in Vienna, Austria, studying at the Hochschule für Musik und darstellende Kunst (Academy for Music and Performing Arts), where she was awarded DIPLOMAS in composition and conducting. She also holds DMA and B.Mus. degrees in composition from The Catholic University of America in Washington, DC. As Artistic Director of Capital Composers Alliance from 1988 to 2004, Dr. Peachey organized and produced concerts of works by Washington, DC area composers; from 1989-1993 she was Vice President of Programs for American Women Composers, Inc.
Dr. Peachey teaches music theory and composition at Duke Ellington School of the Arts in Washington, DC. She has taught theory at The Catholic University of America. – The Elements, a ballet commissioned by Washington Ballet and performed in the Kennedy Center with Peachey conducting. – Temptation in the Wilderness, a tone poem for orchestra which Peachey conducted with the Niederösterreichisches Tonkünstlerorchester in the Musikverein, Vienna, Austria. – a composer’s portrait concert at Strathmore Hall Mansion, including the premiere of Views Through a Window, which was commissioned for that occasion by DeReggi Interarts Ensemble. – Exchanges for clarinet, cello, and piano, premiered by Washington Music Ensemble at the Kennedy Center and subsequently performed by New Music Chicago. – Fable for string quartet, performed by the Sunrise Quartet at the Phillips Collection, Baltimore Museum of Art, National Museum of Women in the Arts, Montpelier Cultural Arts Center, and other venues, and broadcast on National Public Radio. – Performances of various works by Washington Contemporary Music Forum, Washington Musica Viva, Capital Composers Alliance, American Women Composers, the In Series, June in Buffalo, the Goshen College Orchestra, and others. – Broadcasts of works on National Public Radio, Austrian Radio Vienna, Chicago area cable TV stations, and on television in South Africa.